I figured this week we could take a break from science and focus on a little bit of style or fun, depending on how you see things. Through various jobs I have become aware that not everyone understands the proper way to present and open a bottle of wine. If you work in the food industry, for example, this can be very important for the diners experience, but training isn’t always provided. Hopefully, the information I give you today will be useful at work and home. So, the first thing to keep in mind when trying to properly open a bottle of wine is your tools! I almost always use a double-hinged “Waiter’s Friend”, because it includes all the tools necessary to get the job done, leads to less broken corks, and is quick and relatively easy to use. There are plenty of other options though, so make sure you have at least one on hand and know how to use it, and if you choose to move forward with anything other than a “Waiter’s Friend” you will also need something to cut the foil. 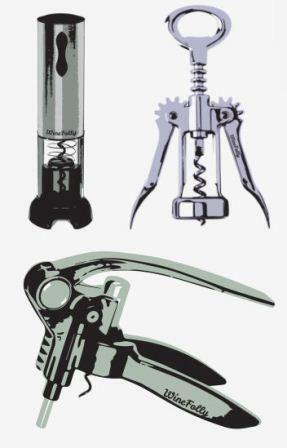 Some of the other options that I recommend are the Winged “butterfly” corkscrew, which is vintage but tricky, the “bunny-ear” lever corkscrew, which is quick, easy, and fun, but bulky, and the electric wine opener, which is very futuristic, but needs power to work, however these are all more difficult to transport, and you will need extra tools for a pretty end result. There are others that I definitely do not recommend for beginners. The Ah-so is great if you’re an experienced collector who constantly runs into older, more fragile corks, but it doesn’t work so well on plastic corks, or fresh ones. 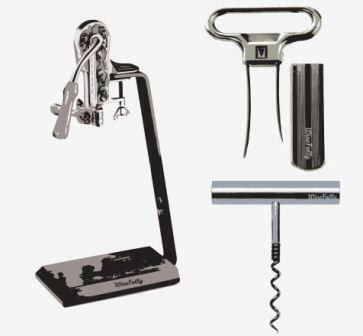 The table top wine opener is great if you have an established home bar, but again it takes up a lot of space and is somewhat bulky to use. Then there is the twist and pull corkscrew which can be small enough to stick in your pocket and is great if you have upper body strength and want to show it off, but generally you have to stick a bottle between your knees to get the right leverage. So, now that we have picked our weapon, you must retrieve the bottle of your choice. But before that if you chose to participate in my next trick, light your candle! Whether your bottle is old or young, stored laying down (as it should be), or standing up, always transport it in as close to the same position as it was stored. Even young bottles can present with sediment (not a bad thing) and if you move it in such a way that you don’t disturb the liquid within, you’re less likely to get a glass of sediment. 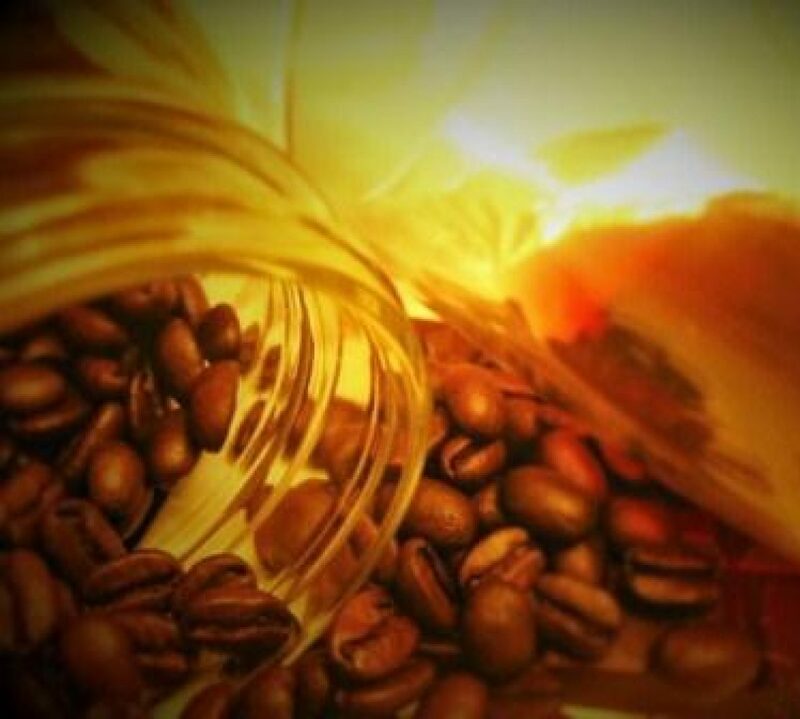 Now if you chose to use a candle, you can hold the wine in front of it and any sediment should be visible as a shadow against the light, if you don’t see any, you don’t need to continue with such caution, but I am going to act like you did. Before you open the bottle, always present it to the person who chose it, label up holding the neck and the base where it indents. 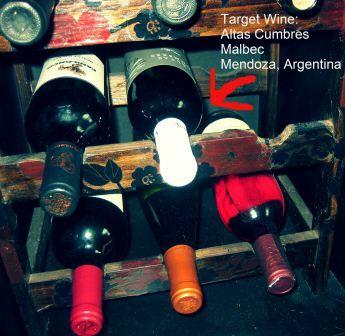 Once they have indicated that this is the correct bottle, you can proceed to open it. Cut the foil from just under the lip of the mouth of the bottle not the top, this gives a better presentation and a decreased chance of foil in the glass. 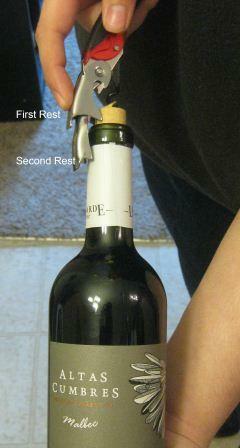 once that is removed, put the corkscrew into the cork, rotating the screw, not the bottle. Once presented the label of the bottle should always face the person who has chosen it. (This is an old custom, from back when restaurant employees would show the correct bottle, put it behind his back and swap it for a cheaper bottle. Sneaky!) If you’re using a double-hinged waiter’s helper, like me, once the cork is most of the way in, about a half of a turn before completely submerged, press the first rest against the lip of the bottle and pull up. The cork should easily come up half way, use the second rest to pull it out the rest of the way, careful not to jerk it in any direction and break the cork. 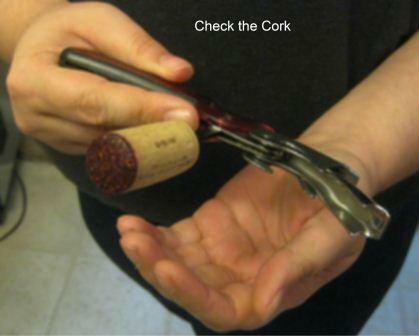 Before you pour, remove the cork from the screw and check it for faults. A good cork should be stained just on the surface facing the wine, it should smell slightly sweet and give slightly under pressure. 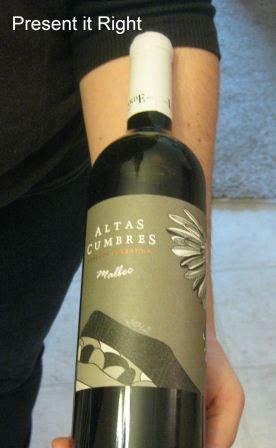 Sniff it, if it smells like walnuts or wet dog there is a good chance the wine itself is faulted. If the cork feels mushy, or crumbly, or if it is streaked with red along the length, these are all signs of potential faults. Once the bottle is open, and you’ve checked the cork for faults, you can pour a small amount in to the choosers glass, and let him or her determine if it tastes right. Assuming it does, you may either carefully pour it into a decanter using the candle to guide you if there is a large amount of sediment, or you may pour it into the glasses, starting with the selector, and then serving the women going clockwise and then returning for the men in the same direction. You should always serve to the turn of the glass, and don’t forget to leave the remainder of the bottle on the table. Now, I mentioned up top that you can use an aerator, this is more often used at home, instead of a restaurant setting to quickly oxidize the wine and change its flavor. Generally speaking, contact with oxygen relaxes a wine’s tannin and makes it smoother on the palate. (we will talk more about this later) It essentially does the same job as a decanter with less of a show, unless you have a really cool looking aerator like I do. Also, instead of using the candle you could just use a filter, which is a small, flat, metal, mesh sieve that you lay across the mouth of a glass to catch any particulates as you pour. Again, this is less showy and involves less skill and patience. After you have followed all of these steps you’re ready to enjoy your wine, so get out there and crack open some bottles! As always let me know what you try, and if you have any questions!